comprising 201129965 amino acids abstracted from 265241 references. 145277 entries have been revised. The growth of the database is summarized below. 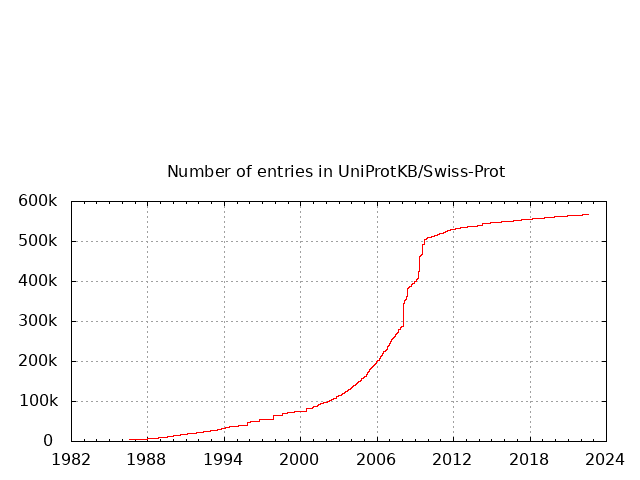 The average sequence length in UniProtKB/Swiss-Prot is 359 amino acids. The shortest sequence is   GWA_SEPOF (P83570):     2 amino acids. The longest sequence is  TITIN_MOUSE (A2ASS6): 35213 amino acids. 2        11446   Proceedings of the National Academy of Sciences of the U.S.A.
4464 entries are encoded on a mitochondrion, and 3897 are encoded on a plasmid. 199 on unspecified types of plastid.